Jewett Car Co. interurban No. 35 built for the CNA&J in 1902. It is looking brand new in this circa 1905 photograph. The location is a mystery. It is not Gahanna, the Ralston works nor the Long Street end of the line. Let's hope an eagle eye railfan can identify the location. There is a sign in the trees to the right of the interurban car that says "Laundry", not much help. Photo from the Donald A. Kaiser Collection. Late in the year 1900, when construction started on the CNA&J, the builders had ambitious plans to reach each of the places listed in their name. It was not to be. They would build their railroad from the east end of the Mt. Vernon Avenue city streetcar line to the west bank of Big Walnut Creek on the edge of Gahanna and no further. According to a 1902 newspaper article, selectable on the left, the directors had obtained the right of way from Gahanna to Johnstown. It was essentially through flat farm country. New Albany was a very small farming village with no rail service. Johnstown was more promising with some industry although they did have steam railroad service with the Toledo & Ohio Central Railroad. The prospect of building a bridge across the Big Walnut Creek as well as two financial downturns in the panics of 1903 and 1907 may have doomed the project. Instead of becoming a full blown interurban line it had to settle for 8.8 miles of track that included the access to Columbus on the Mt. Vernon Avenue streetcar line. The line terminated at North High Street in Columbus. To get from the High Street in Columbus to Gahanna the car traveled east on Long Street, north on Cleveland Avenue, east on Mt. Vernon Avenue, and north on Taylor Avenue. Next it turned east onto its own track at Atcheson Street (later renamed Maryland Avenue). From Atcheson Street the car turned north on Sunbury Road which took it over the PRR/B&O RR shared main line. The track turned east on Fifth Avenue. At Rarig Avenue there was a short spur leading to the Ralston Steel Car Co. propriety and the CNA&J car barn. Back at Fifth Avenue the main line continued to Seltzer Road turning north to the Columbus-Millersburg Road (A.K.A. Johnstown Road) and continuing to the end of the line at the west bank of the Big Walnut creek. The Columbus-Millersburg Road track was along the side of the road. The Columbus Railway Power & Light Co. had a freight house on the northeast corner of Mt. Vernon and Cleveland Avenues. 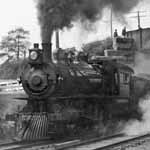 It was used by the Westerville freight motor which ran three trips a day between Columbus and Westerville. A very reliable source, Irv Layton an early member of the Ohio Railway Museum, reported that the CNA&J also used this freight house. It's quite likely that it picked up and delivered at both Gahanna and the Ralston Steel Car Co. There is a discrepancy in time between the opening of the line in early 1901 and the delivery of the Jewett equipment in 1902. It is not known, by this author, what equipment was used during this time. It’s possible streetcars were leased from the Columbus streetcar company for that first year. 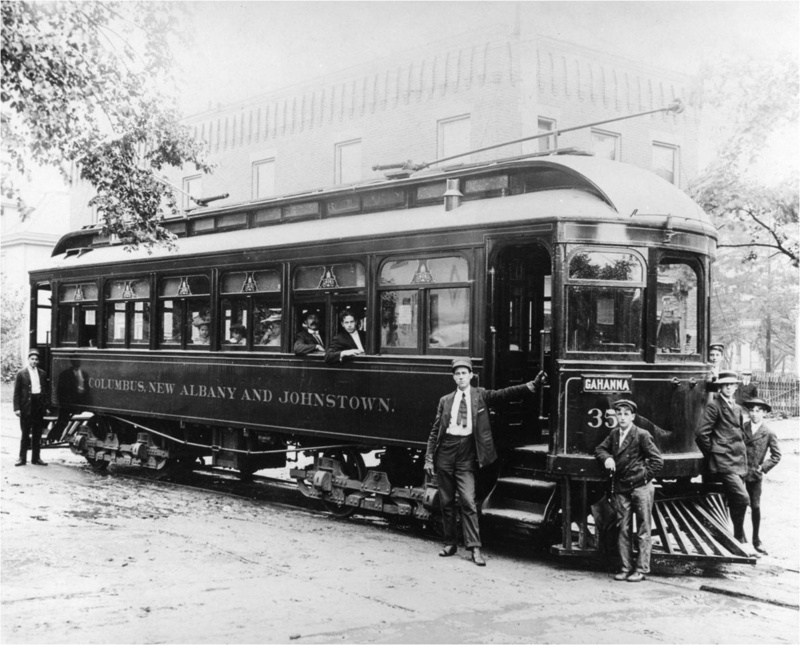 The CNA&J was built to 5’ 2“ gauge in order to be compatible with the Columbus Railway & Light Co. (In 1904 the CR&L became the Columbus Railway Power & Light Co.) The 600 volt DC power was purchased from the CR&L. Unpaid power bills may have contributed to the eventual takeover of the line by CRP&L. Service to Gahanna started in early 1901. February 1924 the CNA&J was taken over by the CRP&L. It became the Ralston Division with four zones. November 1928 the Ralston Division was discontinued with the Mt. Vernon line extended to East Columbus (the Ralston works). Service to Gahanna had ended.